Do you know what the the primary purpose of your B2B website is? It’s not to get traffic. It’s not to get inbound links It’s not even to rank #1 on Google. Those are all secondary goals. The main purpose of your website is to convert visitors into customers. 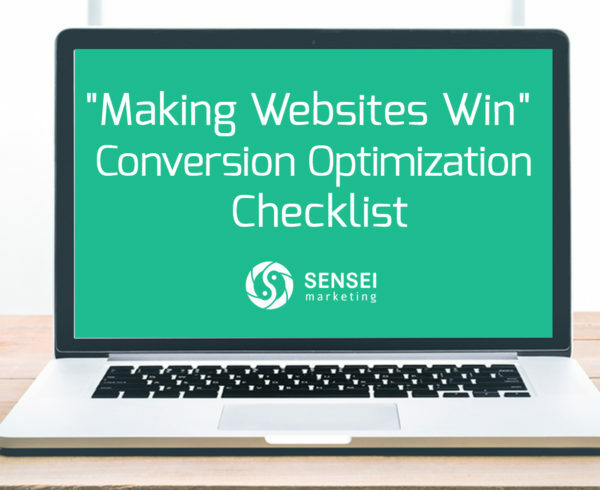 Your website needs to maximize conversion in order to maximize leads and prospects. It should be your top sales source. So how do you ensure your site sells? I don’t pretend to have all the answers, but here’s five tips to get you started. How much time do you spend on the average web visit? The answer is probably somewhere south of 10 seconds. Not a lot of time, in other words. So with that in mind, in order to sell, your site needs to be designed for clarity. You don’t have time to be cute. If your tagline or slogan doesn’t make it crystal clear what your business does – change it or even ditch. If you’re company offers payroll software for small businesses, say you’re a payroll software company for small businesses. If you’re an accounting firm for the healthcare industry, say you’re an accounting firm for the healthcare industry. Make what you do clear, and message it in your website’s header. That way, no matter what page people are on your site, they’ll understand exactly what it is you do. No B2B product or service is for everyone, so make it clear who it’s for. Use the above to signal to your audience that they’re in the right place. When it comes to conversion, action is everything. Your website needs to communicate not only what you do, but how you do it differently. If you’re a CRM company, how are you different than Salesforce? If you’re a Marketing Automation company, how are you different than Hubspot? Use comparison charts, user testimonials, or explainer videos to highlight how you’re unique, how you’re better. Who Else Is Using Your Product or Service? As Robert Cialdini wrote about in his best selling book, Influence: The Psychology of Persuasion, people are more likely to take a specific course of action when they’ve seen others take the same specific course of action. In other words, your website needs to instil a sense of trust. Trust that others have done business with you. Your site shouldn’t just “say” trust, it should “show” trust. Are you familiar with the sales motto “make sure to ask for the sale”? Your website needs to do the same. That’s not to say that you ask every visitor to get a quote, or complete your contact form. That’s because your visitors are all going to be in different stages of the buying cycle. Visitors with different needs should be given different options. This is where your primary and secondary conversion goals come in to play. Your primary conversion goals are targeted to those who are further along the purchasing cycle, and are ready to engage your business. Your secondary conversion goals are targeted to those who are at the top of the funnel, and are still in the awareness and information-gathering stage. The idea with secondary goals is to get the visitor into your network – whether it’s in your database, or just as a social media follower- so you can continue to engage them. Once you’ve identified your primary and secondary conversion goals, it’s important to set them up as goals in Google Analytics. “Your pizza delivered in 30 minutes or it’s free”. “15 minutes could save you 15% on your car insurance”. These are just a couple examples of irresistible offers. 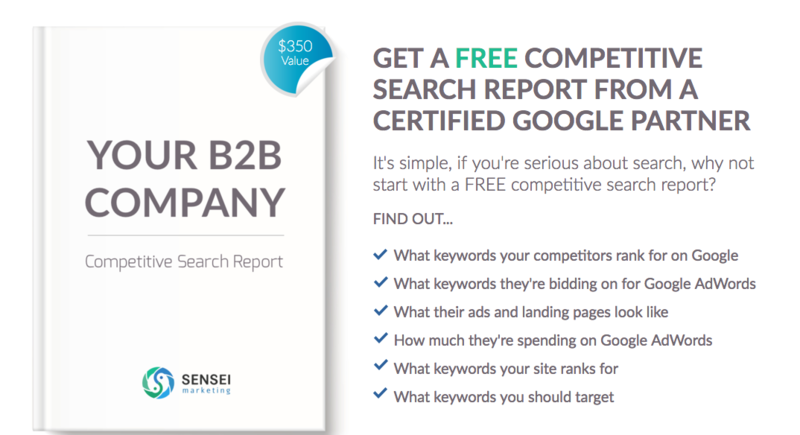 Here’s an example that we’ve used here at Sensei: an offer for B2B companies to get a free competitive search report. An offer like this doesn’t cost us money, but it costs us time. So when devising your offer ask yourself, is there anything that you can DO for your prospects? What can you do to offer them value? Keep in mind that your offer may cost you time (if not money), but that’s part of the investment in lead generation – no different than time spent on product demos, or money spent of digital advertising. Now that you’ve got your conversion goals and irresistible offer, it’s time to test. It’s important to ensure that you create a conversion funnel that drives traffic to your conversion pages. Conversion pages, aka landing pages, are any page that is designed for your visitor to take action. These are the pages that you want to test, test, and test again. They could be your pricing page, free trial page, ebook download page, or even your contact page. Keep in mind testing is a journey, not a destination. That’s because you’re never done testing, there will always be room for improvement. The last step for optimizing your B2B website for conversion is engaging your visitor AFTER they’ve left your site. One thing you can do is create a retargeting campaign. Retargeting campaigns can be useful because a lot of visitors to your site may have just visited your site to read a blog or piece of content, and then moved on without really learning much of anything about your company. 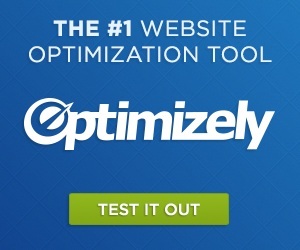 Retargeting ads, such as the one below from Optimizely, can help remind visitors about your business, and get them re-engaged. Personally I’m a fan of offering something in a retargeting ad that may not be available on the website. For example, if someone didn’t sign up for your Saas’ free trial offer and then leaves your site, perhaps offering them a one-on-one demo, or an ebook or white paper might bring them back into your conversion funnel. Beyond retargeting, there’s the big job of engaging. Engaging with your followers on social media. Engaging with your subscribers with email. Engaging both your prospects and customers with valuable, relevant content. Part of the point of engaging is to bring users back to your website, and convert them from a “secondary” prospect, at the top of the funnel, into a “primary” prospect, closer to the bottom of the funnel who’s ready to contact your company. Underlying all of this, is to have a conversion mindset. Conversion rate optimization is a continual, never-ending practice, with the goal of increasing conversion, and leads, over time. Now, go forth and convert!